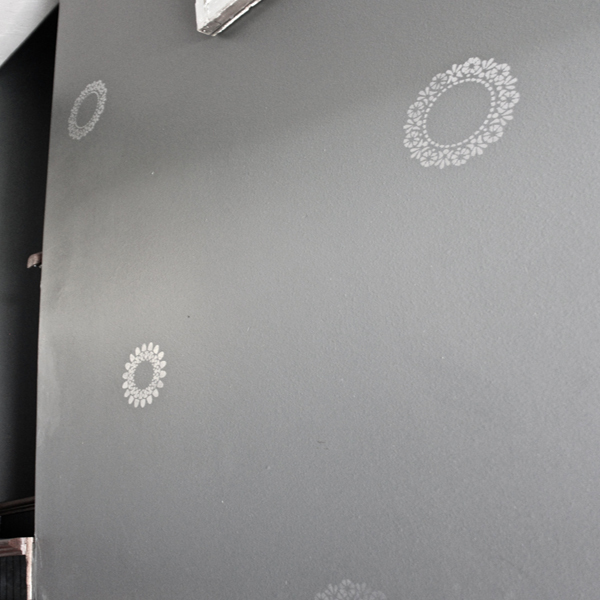 Project Description: If you’d like the idea of a patterned wall but don’t want to deal with the hassle of wallpaper, you might want to consider stencils. 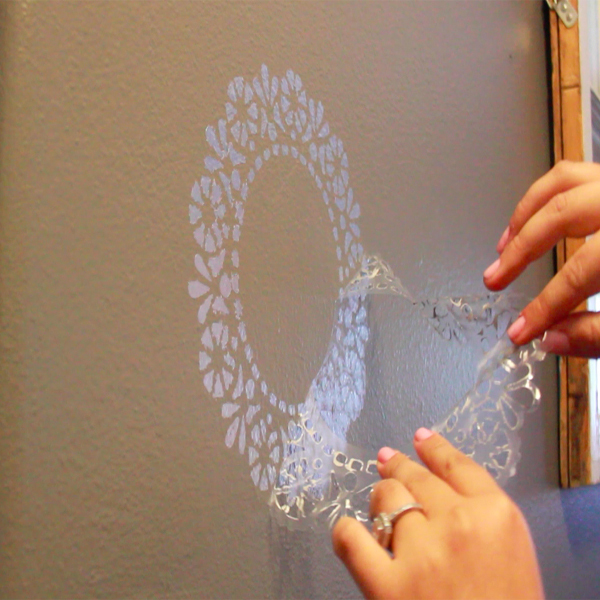 You can create any pattern you’d like, using clear, self-adhesive Frisket Film. This is a thin masking film that can be reused several times. Some stencils would be simple to create with an X-acto knife and cutting mat— for example, triangles, clouds, plus signs, etc. For something more complex, like bicycles or doilies, you’ll want to use an electronic cutter. I’m using my Silhouette Cameo to make a couple of doily stencils. You can download the cut files from the link in the video description. Change the paper type to clear sticker paper, and adjust the blade accordingly. You’ll notice that the canvas size is set to 9 x 12 inches, because that’s the size of the Frisket Film I’m using. Before cutting, make sure that your mat is sufficiently sticky. I like to use a spray basting adhesive for this. Be careful not to spray the margins of the mat. I’m using a silver metallic Pentouch® paint marker for my stencil, for several reasons. First, I love the understated sophistication of silver on gray. It adds shimmer and dimension when the light catches it. Secondly, using a pen instead of a paintbrush is so much easier. I have a lot of control over the ink, and there’s no dripping. Plus, it dries much more quickly than paint. You can also get these metallic pens in gold and copper shades. Wait about a minute for the ink to dry completely, and then gently peel the stencil off the wall using two hands. You can reposition the stencil and re-use it. Be sure to press it firmly to the wall before inking. 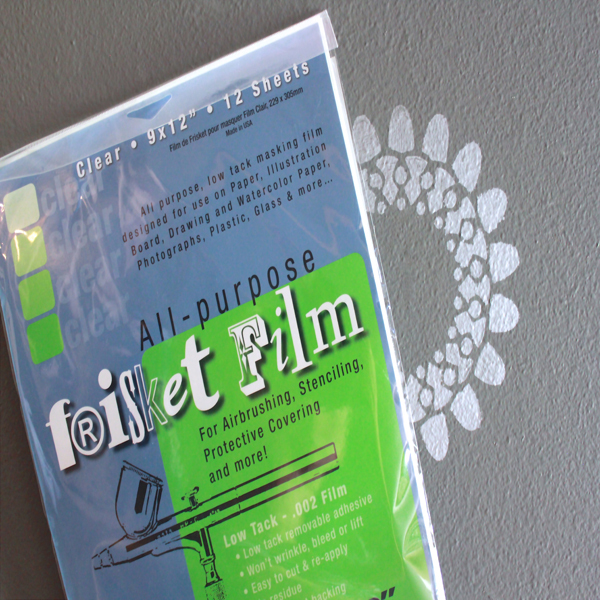 Unlike the plastic stencils you buy in craft stores, Frisket Film stencils can go around corners! If the pen seems like it might be drying out, press the nib down on a piece of scratch paper and the ink will flow perfectly again. 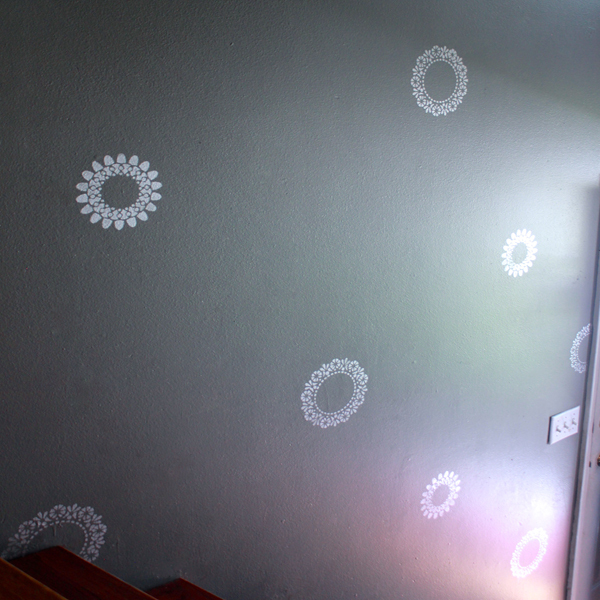 I love this shimmery doily pattern, and it was so much faster- and less expensive- than wallpaper. Plus, I can paint right over it if I decide to try something new.